Denver executive back to yoga after complex spine surgery. “There were only two surgeons in the U.S. that could perform the non-traditional spine surgery needed to remove the broken disc from my spinal cord. Dr. Regan was one of the two surgeons. Now I am pain free and back to life, including yoga for exercise,“ Carylyn states. Carylyn is a successful finance executive who frequently works long hours at a time. Some of her favorite ways to unwind include yoga, strength training and running. When her symptoms did not go away, she went to her general practitioner to seek some relief. The doctor examined Carylyn and ordered diagnostics. The MRI revealed that she had enlarged lymph nodes. More tests would be needed and she was sent to a number of specialists in a two year period. Carylyn even traveled to the Mayo Clinic in Arizona. While at the Mayo Clinic, an MRI revealed a piece of her spinal disc had broken off and was lodged in her spinal cord, this was affecting her muscles and nerves. This was the cause for Carylyn’s breathing problems along with back and shoulder pain. “I was told there were only two surgeons in the U.S. that could perform the non-traditional spine surgery needed to remove the broken disc from my spinal cord,” Carylyn remembers. Fellowship-trained spine surgeon Dr. John Regan was one of these surgeons. Carylyn made arrangements to fly to southern California to meet with Dr. Regan. The surgeon viewed her diagnostics and discussed with Carylyn the Video Assisted Thoracic Surgery necessary to treat the problem. It was important that the surgery take place soon and Carylyn wanted Dr. Regan to perform the surgery. The surgeon cleared his schedule and performed the complex thoracic spine surgery the next day. Video Assisted Thoracic Surgery (VATS), is a minimally invasive surgery that allows the surgeon to directly access the thoracic area (chest) without a big incision. Three or four small incisions (1-2 inches) are made to allow the surgeon to use the video camera and endoscope needed for this operation. A very small video camera is used to project pictures of the chest cavity onto a screen during the procedure. Dr. Regan removed the disc from her spinal cord and Carylyn felt immediate relief from symptoms she had lived with for years. Dr. Regan did caution Carylyn that a fusion surgery may be necessary in the future to further stabilize her spine. A couple years later, Carylyn began having some left leg pain, especially when sitting. One day while running on the treadmill, Carylyn noticed her left leg would not go as fast as her right. She immediately knew something was wrong. She called Dr. Regan and also went to a hospital nearby for an MRI. Dr. Regan was able to view the MRI results and soon determined Carylyn would need the fusion surgery to stabilize the discs at L5-S1. She made arrangements to travel to southern California to see Dr. Regan. The surgeon discussed with Carylyn the Transforaminal Lumbar Interbody Fusion (TLIF) procedure she would need to stabilize the discs at L5-S1. Dr. Regan performed the follow-up surgery and it was a success. Carylyn felt immediate relief from her leg pain. Today, Carylyn is back to her career in the finance industry. She is back to the gym and back to enjoying yoga - all without pain. 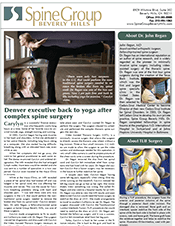 Click here to download a PDF of Carylyn's successful recovery from complex spine surgery performed by Dr. John Regan. Watch as Carylyn talk about her successful recovery from spine surgery performed by Dr. John Regan.